Landscaping with Rocks: Fun and Practical - Executive Landscaping, Inc.
Landscaping is a term that generally brings to mind all things green and growing. Not always ideal in areas like Florida, where dry conditions and high temps can put the health of your plants at risk, though it certainly can be done. For a break from the higher maintenance landscaping components, landscaping with rocks is a great alternative that offers huge appeal. Plan before you pick and plop, and a low-maintenance landscape feature using rocks can become your new favorite thing. One of the biggest benefits of landscaping with rocks is pretty obvious, regardless of how much of a novice you might be. As non-living things, rocks require zero water. They also require zero upkeep. No fertilizing, no pruning, no applications of pesticides or herbicides. They’re a completely eco-friendly way to landscape that’s pretty much no-fuss. You can, of course, use them in combination with plants in your landscape design, but even on their own, rocks offer a great look. Rocks naturally have variations in color, texture, size and shape. By virtue of that alone, they bring in visual interest wherever they are placed. As a stand-alone feature, create a retaining wall with rocks or even as a natural looking water feature like a fountain. Some types of rocks are great for use as pathways and in walkways as an alternative to poured concrete, making rocks useful across a wide variety of applications. 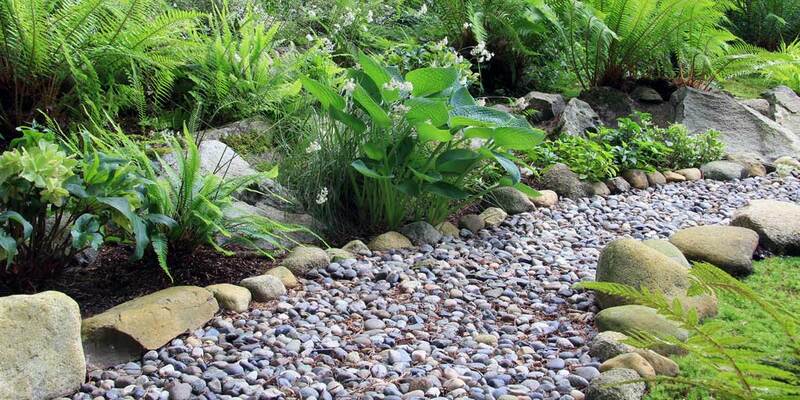 Your yard doesn’t have to be large to take well to a design using rocks. Consider using them in garden beds, as border edging along driveways or around planting beds. Their size will naturally determine where they work best. Color comes more into play when the rocks you select will be highly visible, as you’ll want to stick to a more uniform look in those rocks. Landscaping with rocks shouldn’t be rigid. Rocks are naturally irregular, so use that irregularity to your advantage. Use their colors, textures and shapes to set your landscape apart from everyone else’s and achieve a look that really is customized to you. At Executive Landscaping, Inc., we can work with you to design a landscape plan using rocks to create a beautiful, eco-friendly yard you’ll love for years to come. Give the landscape experts at Executive Landscaping, Inc. a call to learn more about how landscaping with rocks will help you achieve an Executive Masterpiece today!